All Circle/Divisional/Branch Secretaries of FNPO affiliated unions. 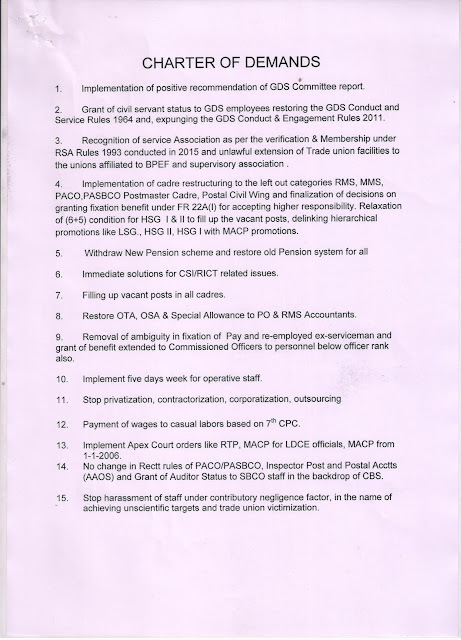 As you are well aware that the NUGDS, AIGDSU and NFPE GDS unions had served strike notice on 3.5.2018 for indefinite strike from 22.5.2018 for implementation of Kamalesh Chandra Committee positive recommendations which is delayed indefinitely and 3 Lakh GDS employees are frustrated. The available General Secretaries of FNPO and NFPE met and formed PJCA on 16.5.2018. The Federal Secretariat of NFPE was also in session on the same day. It was unanimously decided to support the strike of GDS employees. 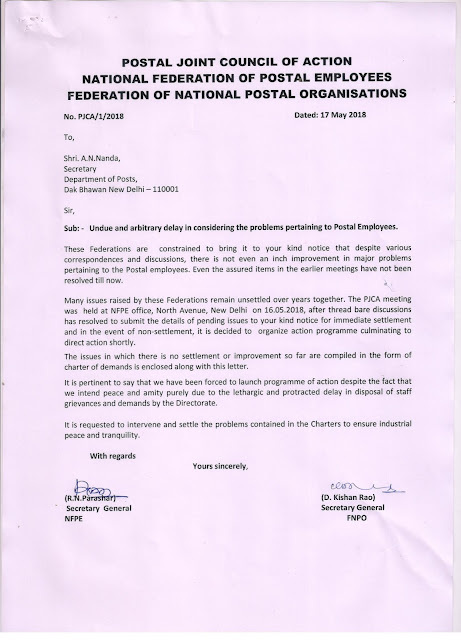 The PJCA consisting of NFPE and FNPO served a letter on 17.5.2018 to the Secretary in unequivocally terms that the Postal JCA supports the strike of GDS employees in total solidarity and it will decide future programme shortly if the demand is not settled and it is made clear that the Department is only responsible for the paralisation of postal services at this crucial juncture. 1. All the affiliated unions should extend full support in solidarity and organize for the total strike of GDS employees. 2. According to the local situations they may form local JCA and cooperate to the strike according to the situation and see that the strike is total. 4. 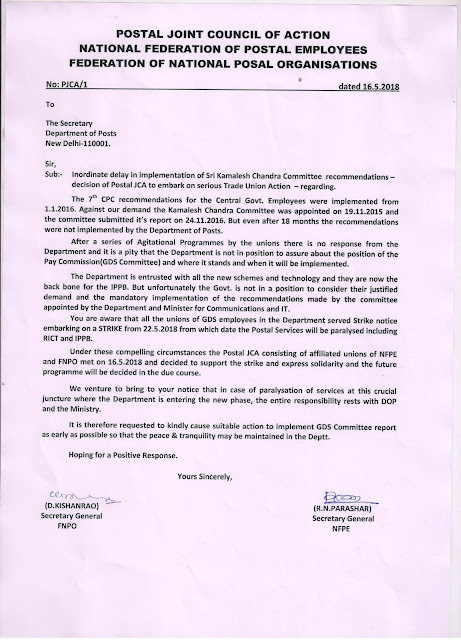 They should protest wearing black badges against the callous attitude of the Department and Government. 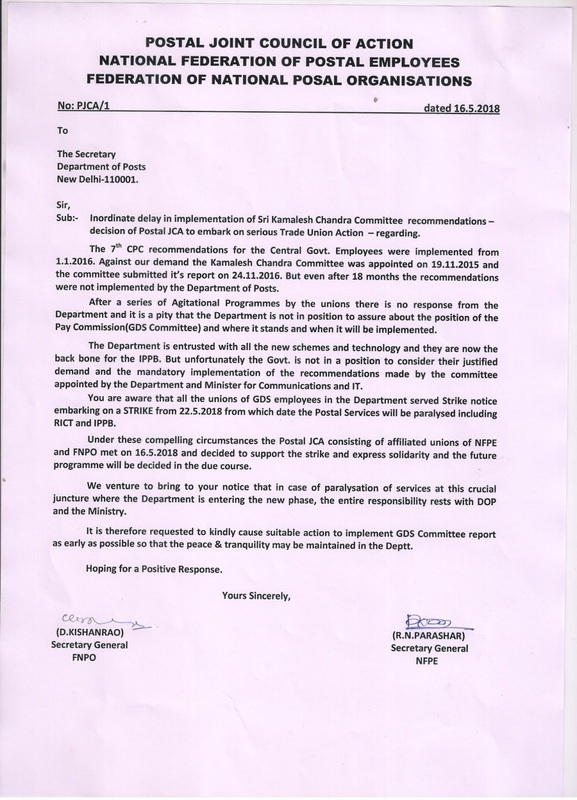 All should understand that due to the technical compulsions the Postal JCA didn’t join the strike from the said date. 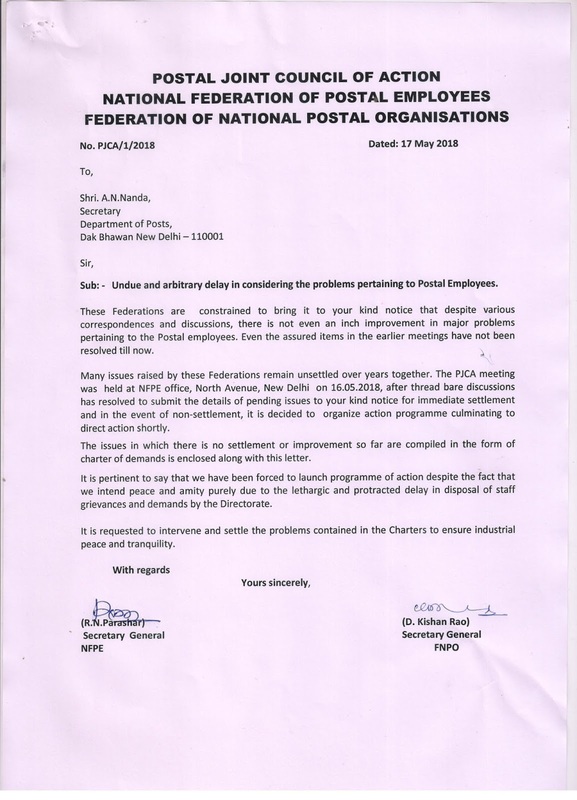 The Postal JCA is watching the situation and take appropriate action in due course and will maintain broader unity for fulfillment of the charter of demands served on 17.5.2018 including the GDS demands (appended). Make preparations for the future direct action. The agitation should send a message to the Department that the powder is dry and it will culminate to an indefinite strike shortly.